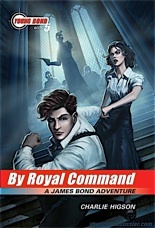 The U.S. paperback edition of Charlie Higson’s fifth Young Bond novel, By Royal Command , is now available for pre-order on Amazon.com. Release date is May 10, 2011. No cover art yet, but I've confirmed with Disney that the paperback will feature the same Owen Richardson cover art as seen on the U.S. hardcover released in May of this year. Also just listed on Amazon (with cover art!) is the U.S. hardcover edition of Charlie Higson’s second zombie-horror novel, The Dead . Release date is June 14, 2011. The paperback edition of Book 1, The Enemy , is also available for pre-order with a May 10, 2011 release date.